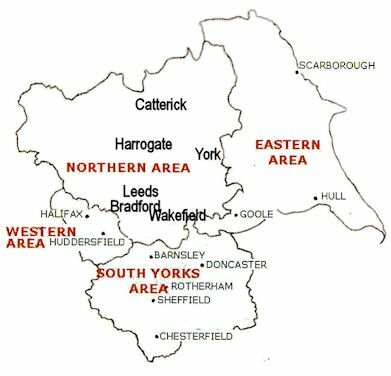 The grid map shows the county of Yorkshire including the regions, principle towns and major roads. All the places visited in this web-site are listed below with their map grid reference. By clicking with the mouse on any place name in the list, you will be taken to the web page for that location. For extra convenience clicking any Map Reference in the schedule will put the map centre screen. This provides an alternative to the main site buttons and links for accessing the attractions, and has the added advantage of indicating an approximate location. We have included a Multimap search box to assist you in locating places or finding routes. Please enter a place name, address, or postcode in the search box, click the button and see a map on the Multimap site. The search does not always work well with attraction names such as "National Railway Museum", it prefers a Village or Town name or an address, a postcode is even better as it will highlight the location with a red circle.